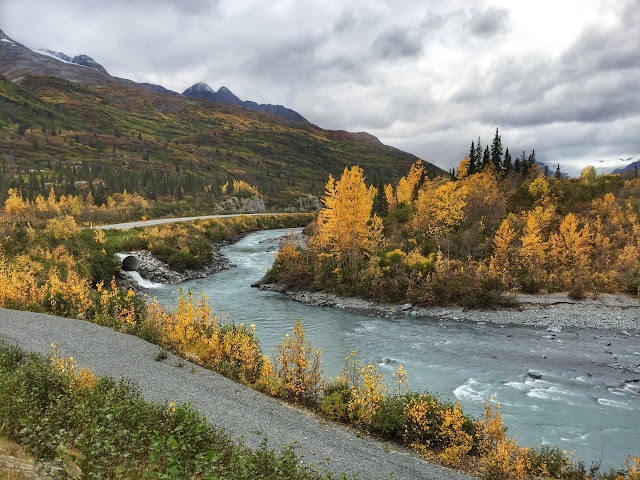 On Tuesday morning, we set out to drive south on the Richardson Highway (AK-4) to the coastal city of Valdez (val-deez). 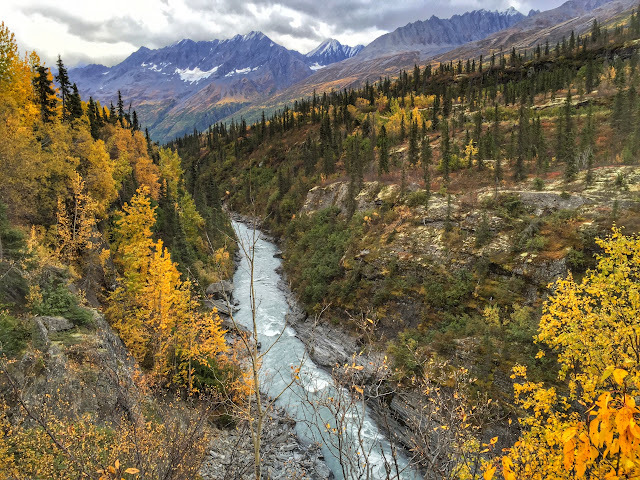 Our first stop, just a few miles south of Glennallen, was Wrangell-St. Elias National Park. Even in a state famous for its size, this park stands out. Encompassing almost 10 million acres of wilderness, it is by far the largest of our national parks—larger than Yellowstone and Yosemite, plus the country of Switzerland combined. Its landscape is vast—mountains beyond mountains, glaciers after glaciers, rivers upon rivers, and lakes over lakes. Copper on the sign references the Copper River basin where this main visitor center is located. 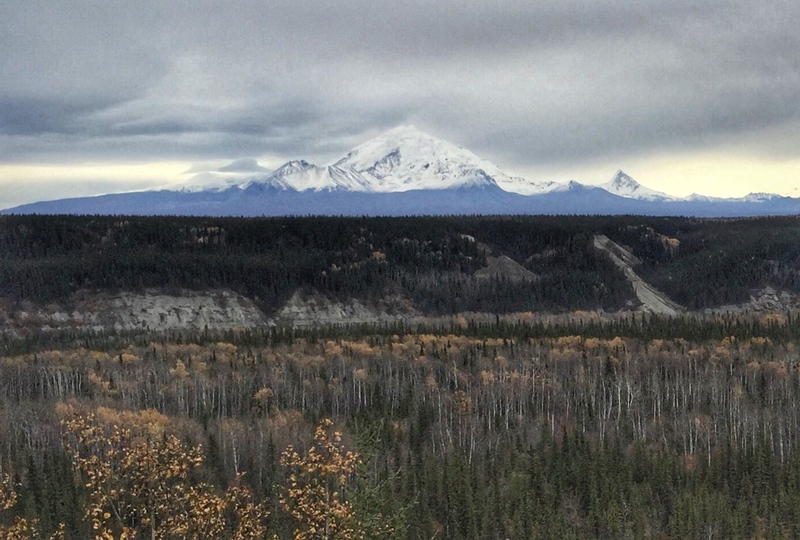 Four major mountain ranges converge at the park: the volcanic Wrangells, the Alaska, the Chugach, and the St. Elias, the tallest coastal mountains in the world. Together they contain nine of the 16 highest peaks in the United States, four of them above 16,000 feet. More than 150 glaciers are found in the park, including the Malaspina, which is larger than Rhode Island. In 1980, Wrangell-St. Elias and adjoining Kluane National Park Reserve in Canada, along with Glacier Bay NP and Tatshenshini in British Columbia, were designated a United Nations World Heritage site. The operation of Wrangell-St. Elias is quite different from national parks in the lower 48. Native groups and certain other Alaskans are permitted to conduct subsistence hunting within its boundaries. 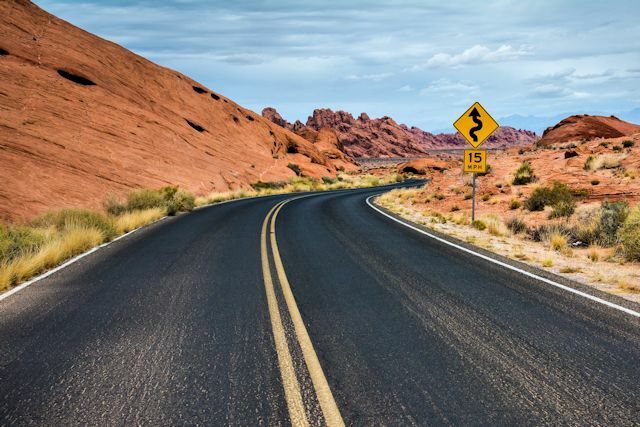 Roads in the park are extremely limited, meaning many travelers view the major peaks of the park from nearby highways. 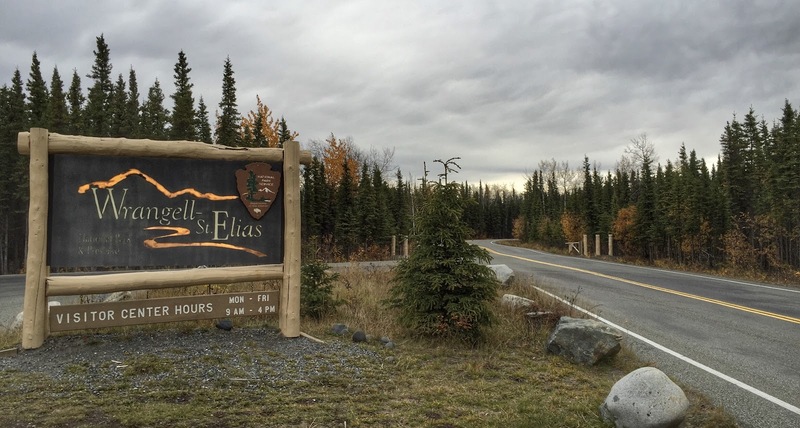 Despite its size, Wrangell-St. Elias doesn’t get many visitors. Only about 65,000 people come to the park every year. So it was no surprise to find the parking lot completely empty when we arrived. Exploring one of the park roads would have involved most of the day, so we limited our visit to the exhibits at the visitor center and a short hike on the Boreal Forest-Valdez Loop Trail. 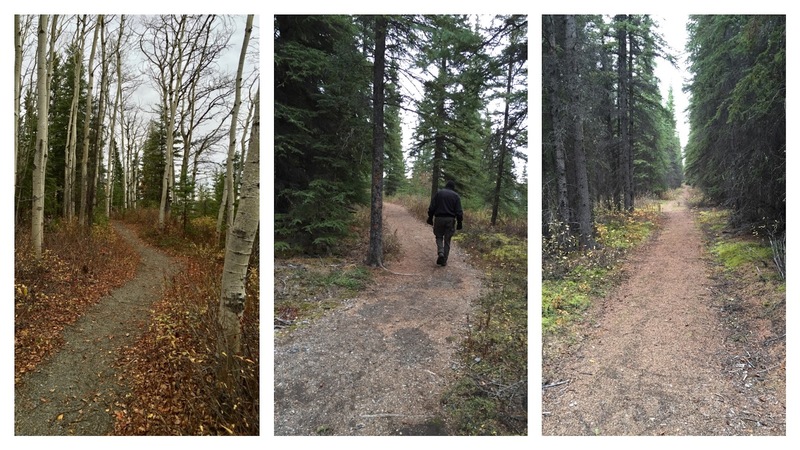 Though less than a mile long, the trail allows visitors to see an abrupt shift from one forest successional stage to the next. 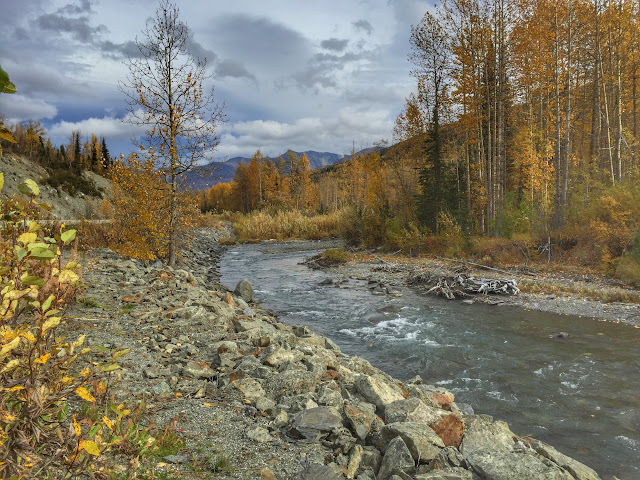 The second half follows a remnant of the historic Valdez Trail, constructed near the end of the 19th century to take gold prospectors from Valdez to Fairbanks. Before leaving the park, we also planted a letterbox—the first in what we hope will be an ongoing series called "Love This Park." 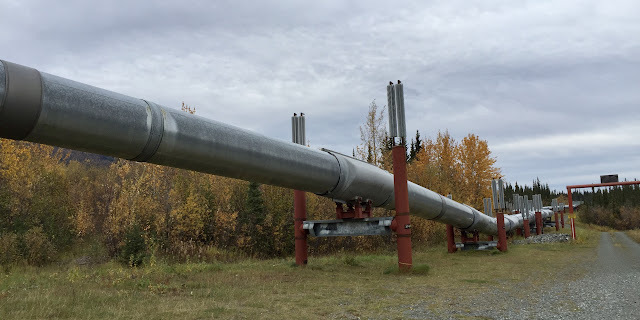 As we continued south on the Richardson Highway, the Alyeska Pipeline, running parallel to the highway, was often in sight. Built between 1975 and 1977, the 48-inch diameter pipeline winds through three major mountain ranges from Prudhoe Bay on Alaska's northern coast to Valdez on the southern shore. There the oil is fed by gravity into tanks or directly into waiting oil tankers at the marine terminal. We were a bit surprised to find places that invited visitors to have a close-up view of the pipeline, even offering interpretive signage in some locations. Bumpy expansion joint repairs and mild frost heaves produced a constant thump every few yards, but the spectacular fall scenery more than made up for the uneven highway. Birches, aspens, cottonwoods, poplars, and willows still sported brilliant leaves in every shade of yellow, contrasting with the dark green of the white spruce climbing up the mountainsides. Fifty miles north of Valdez, we encountered the rain we had seen ahead for quite some time, though it turned out to be intermittent. At the Tsaina River Bridge, we stopped to check out the Devil's Elbow where the waters of the river surge through a gorge. Impressive views were available from both sides of the bridge. 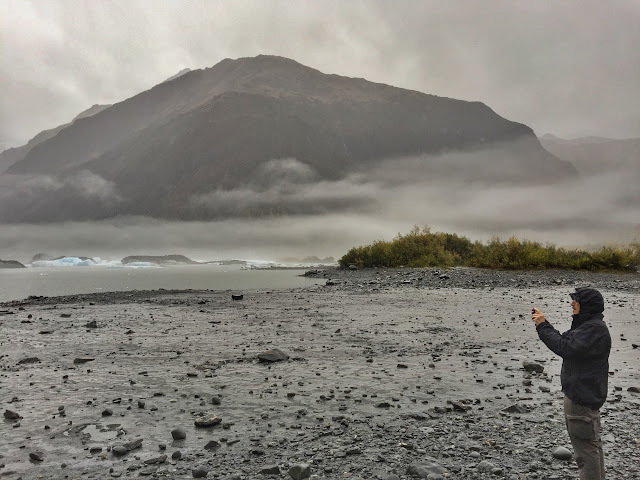 A bit further on, we stopped at Worthington Glacier State Recreation Site for a closer look at the massive sheet of ice we had been seeing from the highway. Covering some 6,000 acres, the glacier, like so many others, is acclaimed as being one of the most accessible in the state. In the parking lot for the rec site, a bright yellow Arctic Oven tent was set up, complete with a stovepipe. With the temperature at 49° and rainy at 3:15 pm, the stove seemed like a great idea. 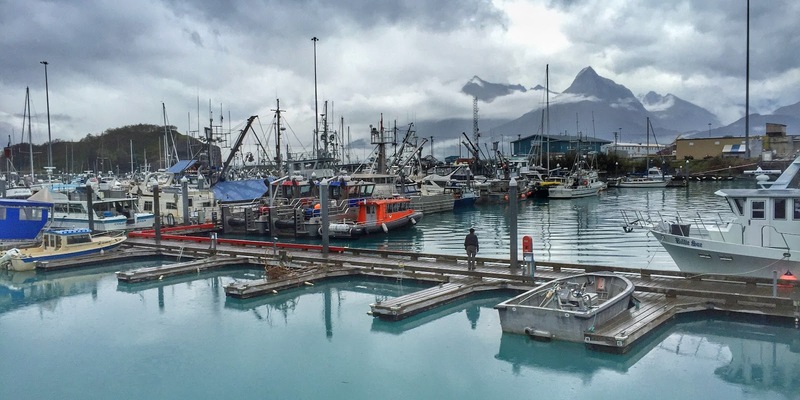 Rain began to fall again as we neared Valdez, and this time it meant business. Nothing severe, yet a very steady patter, which was not enough to stop us from checking out the railroad tunnel that never was. According to the interpretive sign there, in 1905, competition was stiff to become the rail carrier for copper from the lucrative Kennicott Mines to the coast. Nine companies were battling for advantage when an all-out feud erupted, leading eventually to a gun fight. Exactly what happened after that is not clear, but the tunnel was the primary victim. A little south of the tunnel, we stopped at a pullout to check out Bridal Veil Falls and a new letterbox placed conveniently at a trailhead across the road. A few yards south we passed Horsetail Falls and recognized immediately how it got its name. Almost to Valdez, we turned east on Dayville Road for another letterbox at a salmon hatchery. A guy we had met along the way had tipped us off that sea lions had been hanging out at the hatchery, finishing off the last of the year's crop of salmon. We found the letterbox and the well-fattened sea lions. These 700-pounders were looking sated and very happy. Arriving at the Totem Inn, our plans to have dinner at the hotel restaurant went up in smoke when we learned that the kitchen had caught fire Saturday night. But the desk clerk, whose family lives just a few miles from our home in Georgia, recommended the Fat Mermaid nearby. Though it had the look and atmosphere of a comfortable neighborhood pub, the food was quite tasty with healthy alternatives and vegetarian sections on the menu. On Wednesday, we woke up to rain—real pounding, puddle-producing rain that dissuaded us from looking for a letterbox on a trail near the harbor. 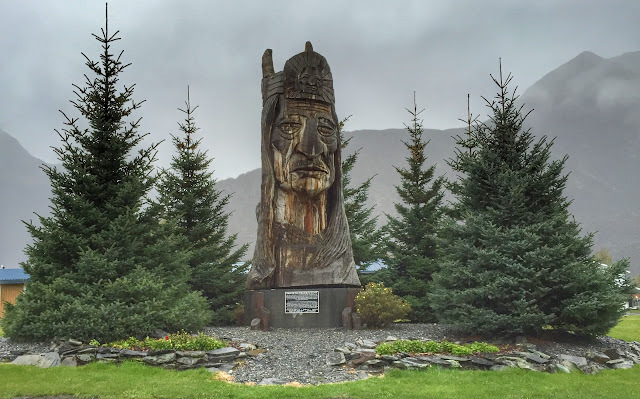 We did visit the campus of Prince William Sound Community College to check out Whispering Giant #40, a 30-ft. bust of a Native American sculpted from a Sitka spruce by Hungarian artist Peter Toth. Unlike so many of these figures we've seen around the U.S., this one did not have a letterbox hidden nearby. They say there's a glacier out there somewhere. Before leaving town, we drove out past the airport to Valdez Glacier Lake at the terminus of the Valdez Glacier. Thick fog shrouded the glacier and surrounding Chugach Mountains, leaving only a few icebergs in view. Move along. Nothing to see here at Old Valdez Town Site. Our last stop was the Old Valdez town site. In 1897, prospectors landed on the coast in search of a route inland to the gold fields. The camp they founded at the foot of Valdez Glacier grew into a supply post and port. The town prospered until struck by North America's most powerful earthquake in 1964. 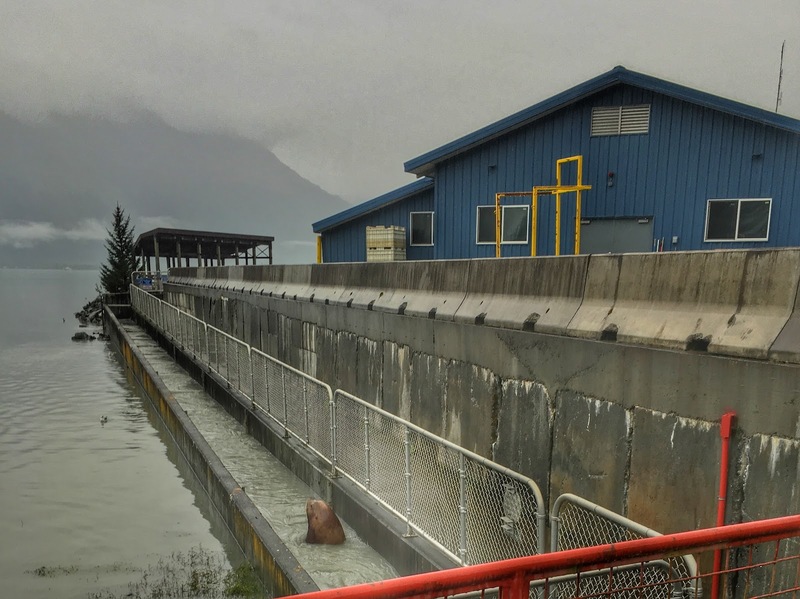 Valdez was devastated, leading federal officials to condemn the town as unsafe and uninhabitable. Survivors forged a new Valdez in a location four miles away. Having seen many references to the Old Valdez Town Site as a place one shouldn't miss, we made sure to stop by there on our way north. All that remains is a collection of interpretive signs and markers indicating what structures stood on various lots amid wide swaths of empty space. Though it's not particularly high at 2,678 feet, we wondered whether we'd see snow at Thompson Pass, the highest point on the southern section of the Richardson. After all, the pass holds Alaska snowfall records for a season (81.2 feet), for a month (24.8 feet), and for a 24-hour period (5.2 feet). In fact, snow pack on the pass has been known to last through the summer because it was so deep. The temp when we left Valdez was in the low 40s, so we thought there might be a chance, but we were pleasantly surprised when we reached the summit at 37° with no snow. Nor was the highway crew we saw yesterday working on culvert replacement this morning. Just too much steady rainfall. Rain continued to fall continuously as we retraced yesterday's route northward. Bright yellow autumn leaves continued to cling to the trees despite the beating they were taking from the rain. By noon, we drove out of the rain at last and stopped for a picnic lunch beside a pretty little pond at Squirrel Creek State Recreation Site south of Glennallen. Hold on, big guy! We just wanted to say hello. About fifteen miles up the road, we finally spotted our first moose of this trip—a burly bull and his lady munching on greenery east of the highway. When we returned to get a better look, they spooked and fled into the woods. 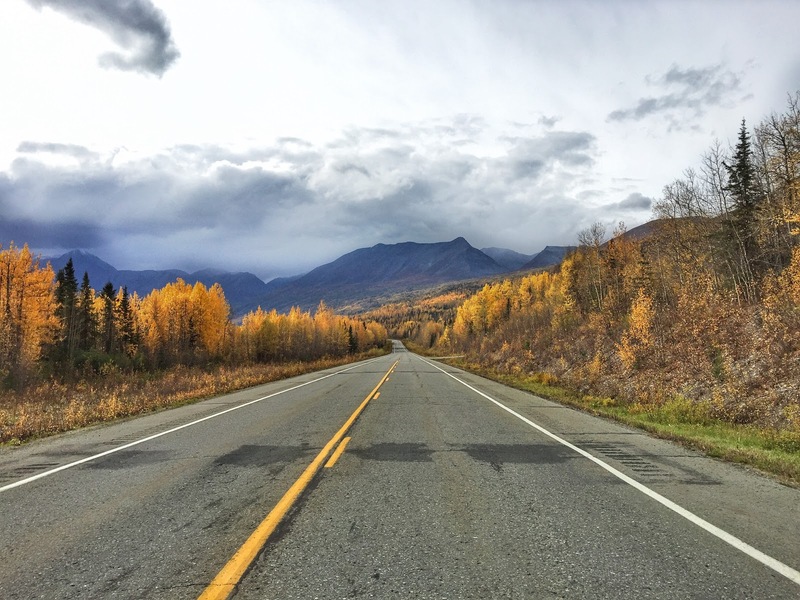 Past Glennallen, we turned onto AK-1, the Tok Cutoff Highway, headed north to Tok. Though we could have stayed on the Richardson all the way to Fairbanks, we decided to go by way of Tok because the route was said to be more scenic and we liked the lodging options better than what was offered along the Richardson. We rang the doorbell, but no one answered. 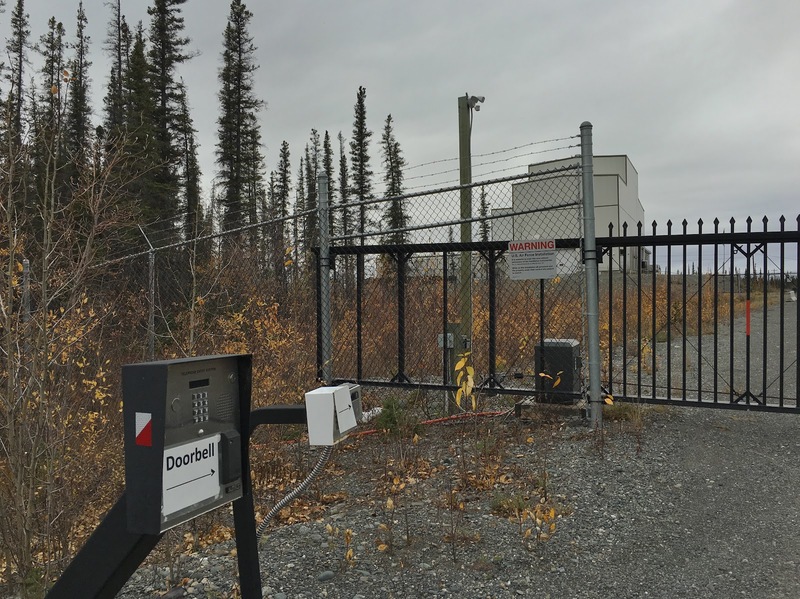 Soon after we changed routes, we came upon a heavily fenced government installation. Stopping outside the gate, we discovered it was home to the High Frequency Active Auroral Research Program (HAARP), a joint project of the U.S. Air Force and Navy. HAARP's mission was to study "the physical and electrical properties of the Earth's ionosphere which can affect military and civilian communication and navigation systems." If that sounds a bit like the purpose statement for a high school science project, consider this. We taxpayers coughed up almost a third of a billion dollars for such items as an HF transmitter and antenna array and UHF ionospheric radar. Begun in 1998, the HAARP was out of tune by 2014 when the Air Force announced it would close the facility. Anyone want to buy a used ionospheric radar? On the remainder of the 140-mile drive to Tok, we stopped for a few letterboxes and searched for wildlife. We found the Milepost surprisingly reliable for the latter, seeing a group of trumpeter swans near mile marker 87, just where the guide predicted. 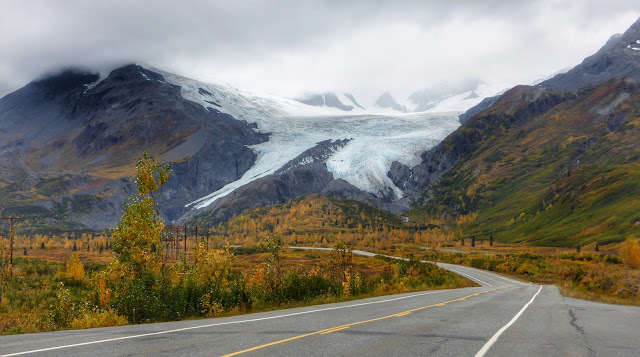 Along the length of the road, we drove through many gentle frost heaves and gravel breaks where the asphalt has been removed for summer repairs. We finally arrived at the cozy Caribou Cabins in Tok just before 6 p.m. After preparing dinner, we did some planning for tomorrow and the next two days in Fairbanks. A Copper River fish wheel. Salmon swim into the baskets and are deposited in a holding tank. Look what I found behind Fast Eddy's in Tok!